Departure times: 10:00, 11:00, 12:00, 13:00, 15:00 and 17:00. Departure times change throughout the year depending on the season. 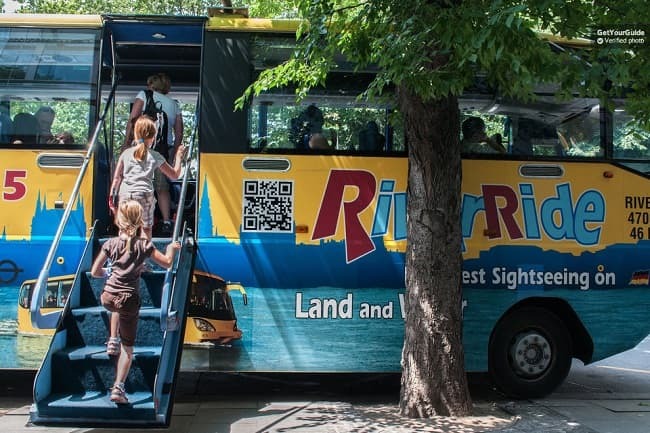 We are comparing Budapest by Land and Water: Floating Bus Tour Prices from leading ticket suppliers and Try to find you Cheap tickets prices on the market. You’ll drive down Budapest’s busiest and best streets (including Andrassy Avenue and Jozsef Attila street) before plunging into the Danube River, a listed UNESCO World Heritage site, to continue the tour down stream. Admire the State Opera, Gellert Baths and the House of Parliament all from the water. Drive past St Stephen’s Basilica, the largest church in Budapest, through Heroes’ Square and pas the Chain Bridge, the first bridge to link Buda to Pest. This alternative tour is a great way to get children involved in sightseeing and provides an exhilarating day out for all! Your Experience With Budapest by Land and Water: Floating Bus Tour? Admire the Danube Palace, Andrassy Avenue and the Gellert Baths all from the comfort of your seat. Marvel at the imperial buildings and neo-gothic architecture from the river. What Budapest by Land and Water: Floating Bus Tour Includes? Food and drink isn't allowed onboard the bus so make sure you fuel up before hand. Travelers Reviews about Budapest by Land and Water: Floating Bus Tour? No food or drink is allowed on the bus. Meeting point: Szechenyi Istvan (ex Roosevelt) Square 7/8.